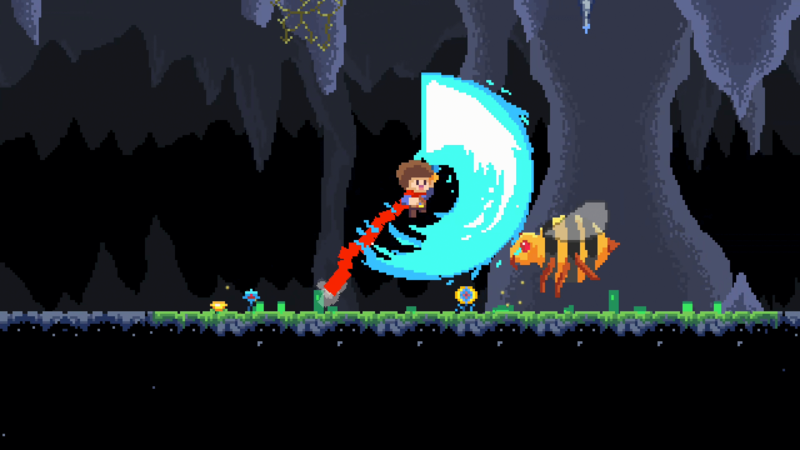 It’s not often we see a kid (or teenager, I suppose) wielding an absolutely enormous sword in a 2D platformer, and in case that wasn’t enough, funky fella also packs an equally oversized bow. How’d he get his hands on such wondrous weaponry, I wonder? How indeed. But there are more important matters at hand: Nara, his love, has been kidnapped by the nasty orc, Korg! Time for an exciting rescue mission, blade in hand, danger at every turn, in JackQuest: The Tale of The Sword! Oh, and there will be no load screens or other nonsense to slow his quest either, the entire world consisting of a a single-interconnected entity – one full of secrets, gems to collect, and plenty hidden challenges. While that last one is mostly for completionists, gems play an absolutely vital role as you will not be able to save your game without them. Yeah. So eh, don’t go too fast, skipping these, ya hear? Unless of course you want the extra challenge of a ‘no-save’ run. Some do. Crazy lot, I say. Although with the ability to wall-jump, slice up foes with your massive sword, and various new abilities found only by exploring every nook and cranny, chances are you should have a robust enough arsenal to withstand even the largest, most fierce boss in this place. Hopefully that also goes for the biggest baddie himself, Korg; but only time will tell. JackQuest: The Tale of The Sword will be on Switch, PlayStation 4, Xbox One and Steam, “in late 2018”.